JIRI MODELS, a company based in Písek, has received a prestigious award from The Walt Disney Company. 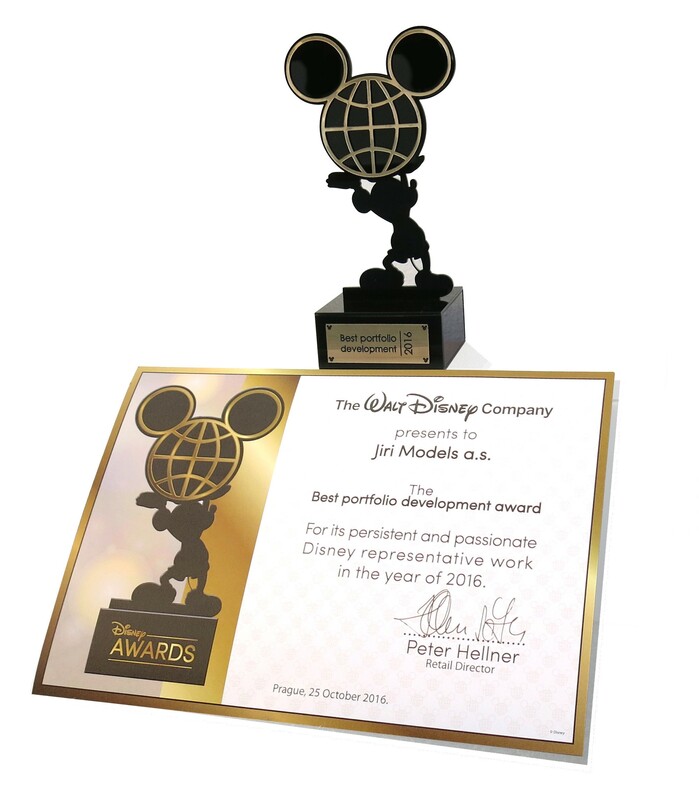 At the annual gala evening for The Walt Disney Company partners, which took place in late October this year at the Cinema City in Prague, the joint-stock company JIRI MODELS received the prestigious award for the best development of product portfolio in 2016. The award was presented to the JIRI MODELS team by the representative of The Walt Disney Company, the director of licensing for the CEE region, Peter Hellner, and the retail manager for the Czech Republic and Slovakia, Miroslav Foldyna. The award was given not only for the great expansion of its product portfolio in the area of publishing and stationary goods, but also for the consistently excellent quality of its products. The Písek company JIRI MODELS has been operating on the Czech, European and global market for over 25 years. It specializes in the development and manufacture of licensed products with characters from Walt Disney stories and films. However, the Czech character Krteček and many unlicensed titles also hold an important place in their portfolio. Over the years, the company has developed into a strong Central-European leader in this field, with European reach and a good name, not only in B2B, but also with end-customers: children and their parents. In the very near future, JIRI MODELS is planning to launch new, surprising, creative and entertaining products that will be a worthwhile contribution to goods offered for sale in stores. The company is also planning to expand their portfolio of licensed products connected with upcoming movie's, such as Vaiana, Despicable Me 3, and the anticipated sequel to the popular family movie, Cars 3. Teenagers will not be forgotten either, as the company is preparing products with motifs from the popular series Soy Luna, specially adapted for this age-group. The newest B2B products will be introduced at the most important world fairs, in particular in Germany, Bologne and Hong-Kong. Find out more about JIRI MODELS’s products at http://www.jirimodels.com. They are available at many retail stores in the Czech Republic.